Get inspired by the stories of African Business Women who come together for this amazing business networking event. 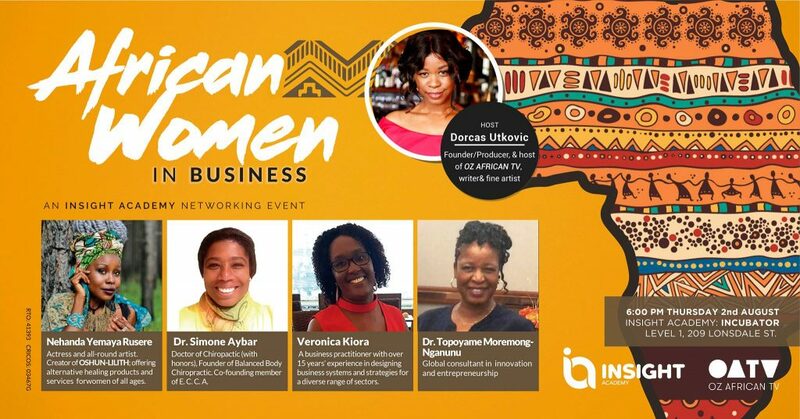 Don’t wait anymore and add our next FREE event ‘African Women in Business’ to your calendar! Come along and expand your knowledge about running a business. A unique chance to see acknowledged people share their experiences and advice! Join us for some insightful presentations and discussion with key players in the Business field. This is a FREE event with the objective of bringing professionals and entrepreneurs together to build networks, foster professional development and explore business opportunities. Subscribe and guarantee your spot! > A fabulous, feminine force” Dorcas is a Producer, Writer, Director, Fine Artist and Artistic/Project Officer. She worked on the set of one of Australia’s biggest export, channel 11’s Neighbours for 7 years in the costume and digital department(s). Dorcas is the Creative Producer/Coordinator for the vibrant annual event One Beat One Love, which forms part of Victorian Multicultural Commission’s Cultural Diversity Week. She is also former Coordinator for the Nelson Mandela Day Celebrations in Melbourne. > An actress and all-around artist. She created a brand and movement called OSHUN-LILITH that is based on products and services that support women to heal and transform their lives. > Bachelor of Science and Doctor of Chiropractic in Palmer College of Chiropractic, Iowa, U.S.A. She is the Co-founding member of Endometriosis Care Centre of Australia. Dr. Aybar opened Balanced Body Chiropractic, in 2014 to join Melbourne Eastern Healthcare in Boronia, an integrative facility with a focus on patient-centered healthcare. > Chief Executive Officer, Diamond Valley Learning Centre, Director of Interlink Consultants and Ashley’s Health Care. A business practitioner with over 15 years’ experience in designing business systems and strategies for clients in a diverse range of sectors including VET, Early Childhood Education and Care, Professional Services and Health. A track record for setting up systems for small businesses looking to be Registered Training Organisations and successfully leading to registrations. > Dr. Topoyame Moremong-Nganunu (BA, MA, MBA, PhD) is a Botswana national who has taught and consulted throughout Africa, the Middle East and the world in the fields of innovation and entrepreneurship. She is the lead coordinator/consultant of Mentor Entrepreneurship Global Group in Africa and the co-founder of Botswana management consulting firm, Development Management Associates as well as the founder of BATHU-BEDU Business Consult. Please feel free to shoot us an Email or give us a call for any questions you may have. Don’t forget to subscribe to this event. Limited space available, so hurry up and register!